A DSE Search schema defines the relationship between data in a table and a DSE Search Solr core. The schema identifies the columns to index in Solr and maps column names to Solr types. Reference information of DataStax Enterprise mapping of Solr types to CQL types and Cassandra validators. Changing a Solr type mapper is rarely if ever done and is not recommended; however, for particular circumstances, such as converting the Solr LongField to TrieLongField, configure the dseTypeMappingVersion using the force option. DSE Search supports the stored=false copyField directive in the schema.xml file. Ingested data is copied by the copy field mechanism to the destination field for search, but is not stored in Cassandra. Unsupported Cassandra and Solr features for DSE Search. In a distributed environment, such as DataStax Enterprise and Cassandra, the data is spread over multiple nodes. Deploy DSE Search nodes in their own datacenter to run DSE Search on all nodes. When you update a table using CQL, the Solr document is updated. Indexing occurs automatically after an update. Writes are durable. All writes to a replica node are recorded in memory and in a commit log before they are acknowledged as a success. If a crash or server failure occurs before the memory tables are flushed to disk, the commit log is replayed on restart to recover any lost writes. Each document in a search core is unique and contains a set of fields that adhere to a user-defined schema. The schema lists the field types and defines how they should be indexed. DSE Search maps search cores to Cassandra tables. Each table has a separate search core on a particular node. 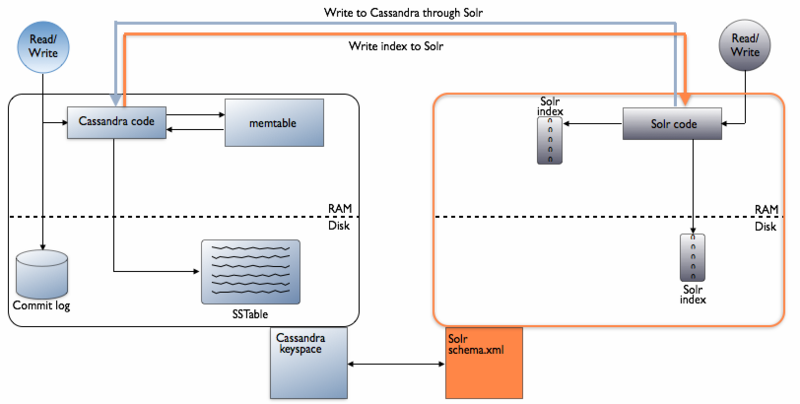 Solr documents are mapped to Cassandra rows, and document fields to columns. A shard is indexed data for a subset of the Cassandra data on the local node. The Cassandra keyspace is a prefix for the name of the search core and has no counterpart in Solr. The search request is routed to enough nodes to cover all token ranges. The query is sent to all token ranges in order to get all possible results. The search engine considers the token ranges that each node is responsible for, taking into account the replication factor (RF), and computes the minimum number of nodes that is required to query all ranges. On DSE Search nodes, the shard selection algorithm for distributed queries uses a series of criteria to route sub-queries to the nodes most capable of handling them. The shard routing is token aware, but is not limited unless the search query specifies a specific token range. With Cassandra replication, a Cassandra node or search core contains more than one partition (shard) of table (collection) data. Unless the replication factor equals the number of cluster nodes, the Cassandra node or search core contains only a portion of the data of the table or collection.